More friends and a blog: Bean recipes? Anyone? It is possible that I have managed to get a little bit carried away in my desire to stock up on food and reduce trips to the grocery store. Still not sure just where I will be storing all these. I was just thinking that I better find some cookbooks with a whole lot of bean recipes in them when I opened the Jamie at Home cookbook (that finally came from the library) last night and I found his Humble Bean recipe. Yay! 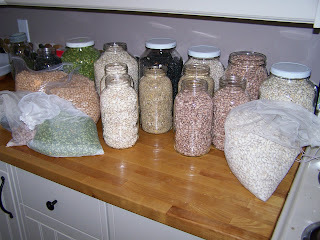 Still, I think I need some more recipes...and some more gallon jars.